We are a taco family. Whether they’re in corn tortillas, flour tortillas or over a bed of Instant Pot brown rice or coconut rice or on a bed of cilantro lime coleslaw – we.love.tacos. What we don’t love, is store-bought taco seasoning. 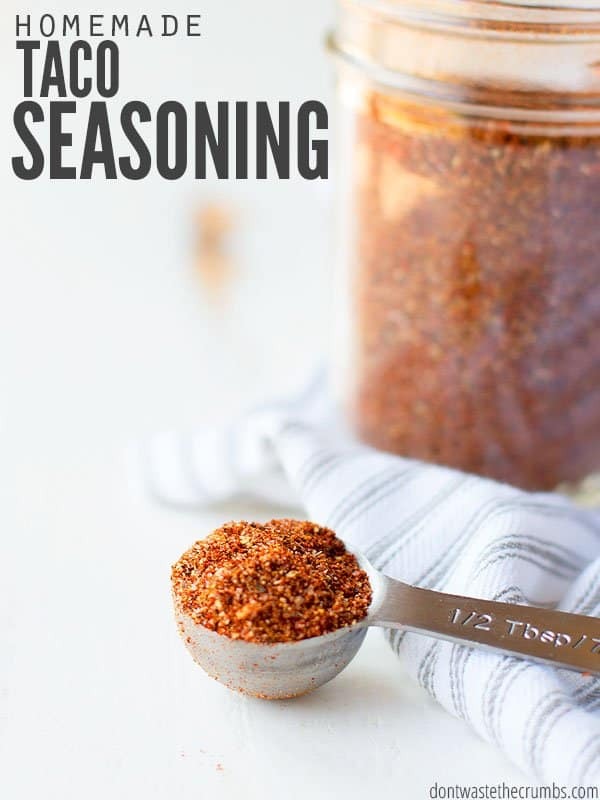 So I use this homemade taco seasoning recipe instead and it hits tacos out of the ballpark, every single time! but then we moved, and moved again, and then I created a grocery shopping course and in the midst of all this, homemade taco seasoning fell to the very bottom of the priority list. And then we did the Whole30. For those who don’t know, the Whole30 is an elimination diet which doesn’t allow any sugar, soy, dairy, legumes, gluten or grains. And there’s sugar in many dried spices too, including store-bought poultry seasoning and taco seasoning. 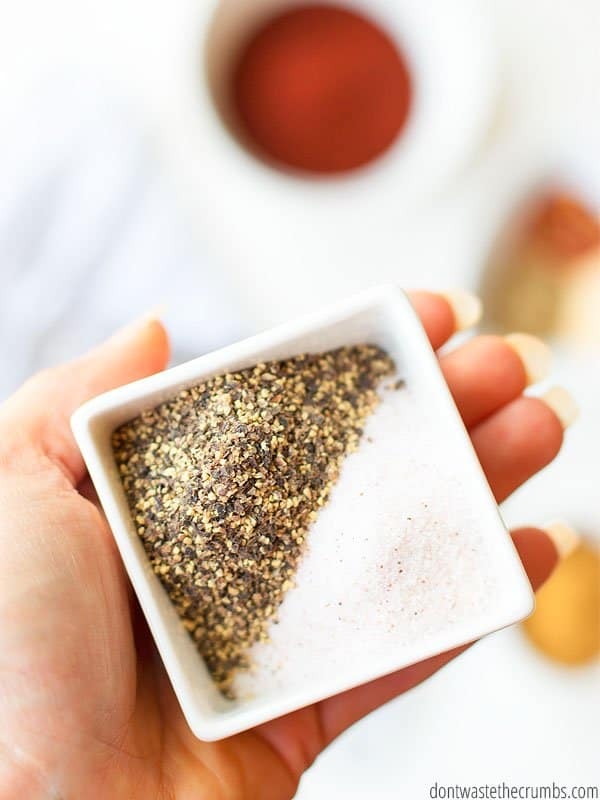 I overcame poultry seasoning easy enough with this delicious homemade poultry seasoning blend. It’s made up of spices I tend to have on hand anyway, and since we use it as a general all-purpose spice on potatoes, vegetables and nearly all meats (except beef), I can make as much as I need to. Since tacos aren’t nearly as delicious without taco seasoning, it was high time I perfected my own homemade taco seasoning recipe! You can adjust homemade spice blends to suit your tastes. We like it flavorful and medium. You might like it straight up hot. Or maybe you have little ones who need it mild for their young taste buds, but you want it to still have enough pizzazz for you too. When you make your own spice blends, smell and taste each spice as you add it to the blend. 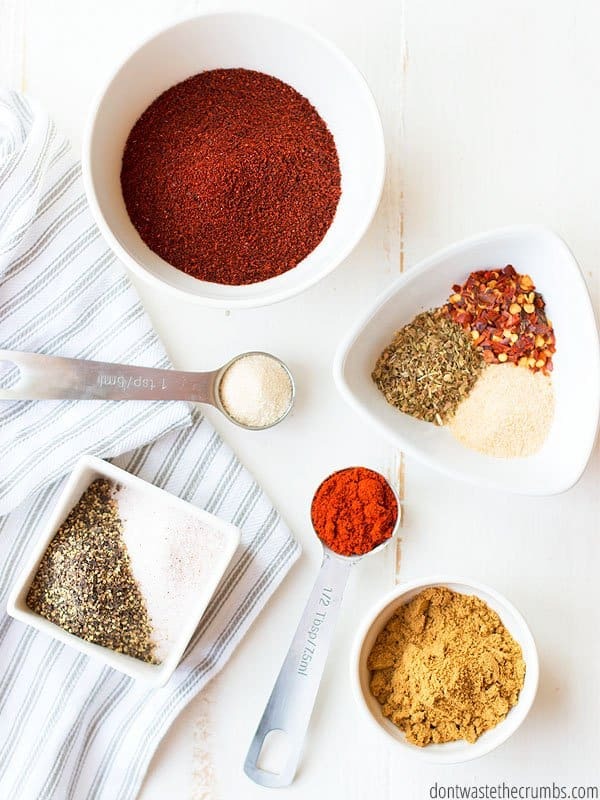 Becoming familiar with what each individual spice tastes like will help you create the perfect blend for you and your family. 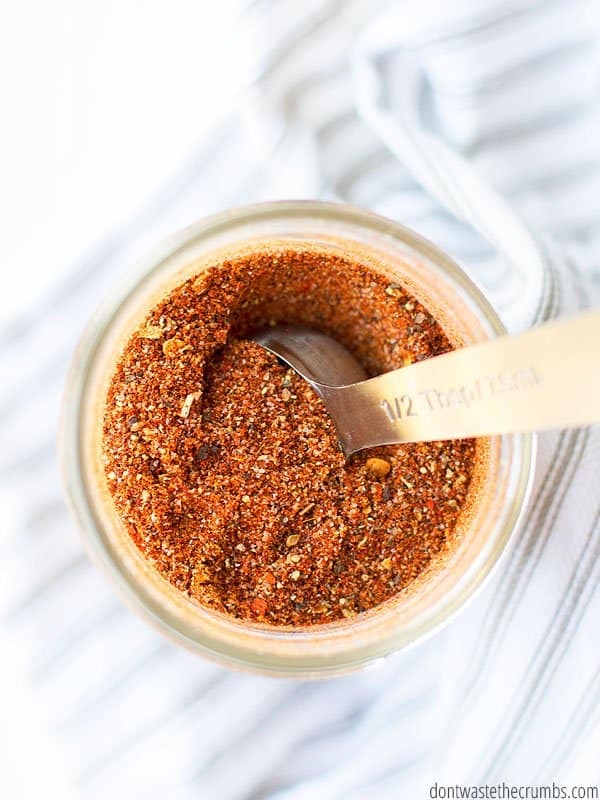 Cumin and chili powder are both in this homemade taco seasoning recipe, but they each have different flavor profiles. You may want more cumin and less chili powder – taste them and experiment! It’s a whole lot cheaper to make your own spice blends. Plus buying single spices means I can re-use them as needed for other recipes. Cumin is one of the key spices in my best ever slow cooker refried beans, but I would never recommend substituting taco seasoning in its place. It’s just not the same! Making your own spice blends is generally healthier. I say generally here because you could probably go to your local health food store and buy taco seasoning that doesn’t have too much junk in it… but you’re also going to pay an arm and a leg. Instead, make your own! You can control exactly what goes into your blend and make sure it meets whatever standard of healthy you’re looking for. If you don’t want salt, then skip it! If you can’t have corn, you can avoid the cornstarch! If you don’t want sugar, this recipe doesn’t have it! Obviously I use this seasoning in my ground beef taco meat recipe, but homemade taco seasoning isn’t just for the meat! I’ve added this to season cauliflower rice and it was SO GOOD. I’ve also added it to crispy potato wedges and to homemade breakfast sausage, to flavor almond crusted baked chicken and in a pinch to make homemade guacamole. 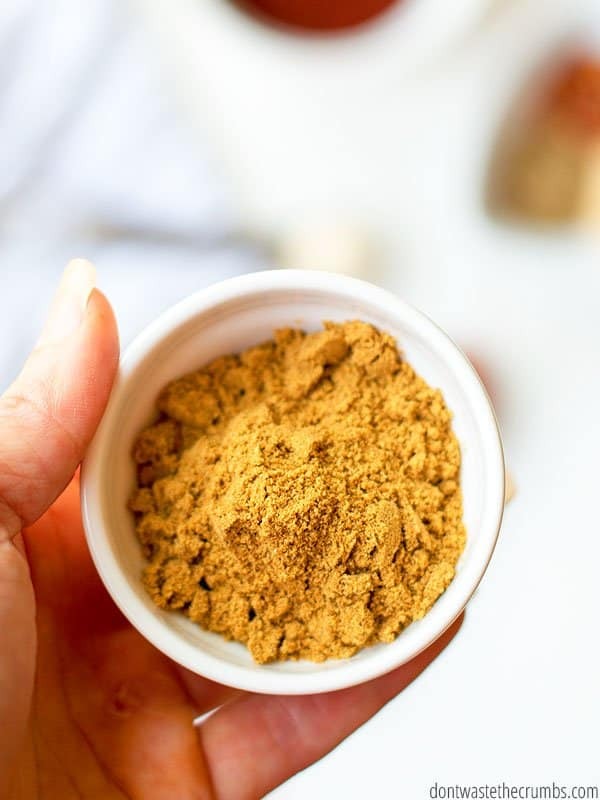 This homemade taco seasoning recipe is also a staple in my easy tortilla soup and if I have a Mexican-food theme on my meal plan, then I’ll use it to flavor my Instant Pot whole chicken too! You could even add it to the easiest scrambled eggs and to spice up homemade chicken nuggets. I’m thinking you really can’t go wrong with shaking a bit of homemade taco seasoning on everything, right? Anytime I buy spices at ALDI (where they’re only 99¢), I keep the glass jars. They’re very similar to this kind, and they line up so nicely in my spice cabinet. Here’s how I remove the labels, and then I use a sharpie to write what blend is inside (sharpie doesn’t wipe off easily, but you can wash it off with soap and water). These small 4 oz mason jars are another good option too. The neat thing about those, is that they’re the perfect size for avocado chocolate mousse or DIY magnesium lotion! Homemade taco seasoning is THE BOMB. It’s SUPER easy, SUPER delicious, and SUPER healthy! Taco seasoning doesn’t just go on taco meat, add it to cauliflower rice, Instant Pot brown rice, tortilla soup, roasted potato wedges (or any veggies really), even scrambled eggs! Yum! Save your jars from other spices and remove the labels. Or use these spice jars, or multipurpose 4oz mason jars. 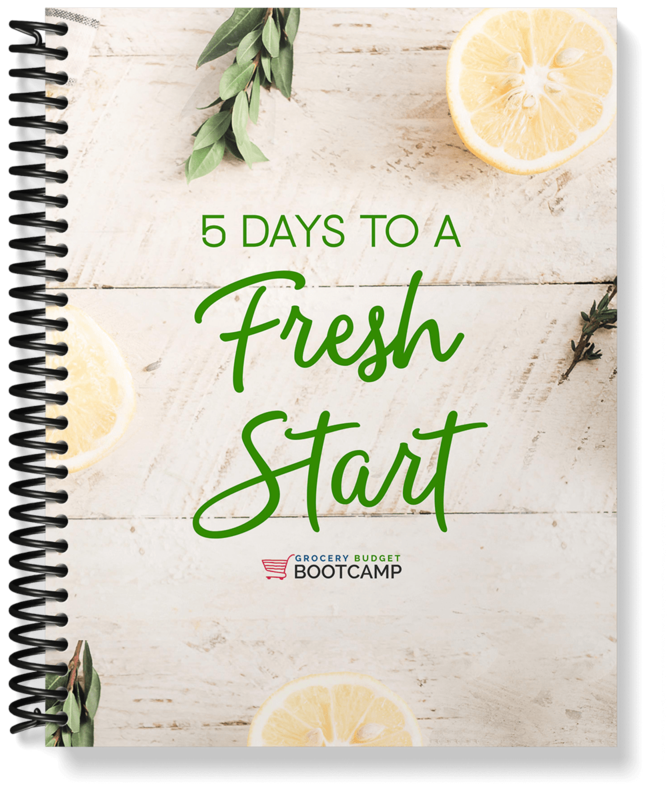 If you’re starting out on your healthy eating, money saving journey go through my FREE 5 day course Fresh Start.Sign up HERE to start taking the baby steps to reach your goals! Combine all ingredients in a glass jar. Shake well and use as desired. Do you have any creative ways to use taco seasoning? I’d love to hear your ideas – please share them in the comments below! Thanks for the recipe! I usually just dump a combo of chili powder and cumin and salt into the meat but it’s a good idea to have a consistent recipe made up ahead. Question: do you have any info on why avoiding sugar in things like condiments and cooking sauces is important outside of a special diet? We lived in Asia for 5 years and the traditional Asian diet is very healthy (for them anyway) but they use sugar to cook savory dishes. However the traditional diet has almost no sweets/desserts in it other than fruit. What’s the big deal with avoiding small amounts of sugar in cooking? Is it just for the Whole 30reset diet or am I missing something? 1) There are a lot of little sugars… which add up and in the end, doesn’t make them so little anymore. 2) Consuming sugar makes our bodies want more sugar. It’s INCREDIBLY addictive, and it’s so easy to fall back in the habit. Processed sugars are especially harmful for the body. 3) As a family, we feel SO MUCH BETTER being sugar-free! OMG! I was just preparing a blog post for my blog, anitasrealfood.com on DIY South of the Border seasoning. It is eerily similar to yours! Maybe I’ll add something else, like Enchilada sauce, or something, and give a shout out to your blog and a link. Great minds think a like?? Agree completely ! Home made is the best ! Thank you ! Definitely trying this soon! I bought a cheap brand of cumin on Amazon, and to me it just doesn’t taste right. Do you have a particular brand of spices you use/recommend? Hi Mary! I’m not partial to brands when it comes to spices – use what you can afford! When you say “onion” and “garlic” do you mean onion powder and garlic powder? Thanks. How much seasoning goes in a lb of ground meat? I usually add 1 Tbsp, but you can add as little or as much as you’d like! When you say chili, do you mean chili powder? Thanks for the recipe! Thanks for these recipes. Just made a double batch of this tonight and used some to for taco meat–nice flavor! Sign up below and give your kitchen and your budget a fresh start with our 5 day challenge!